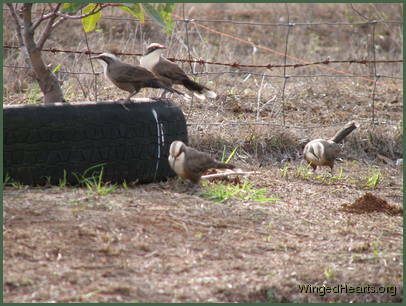 Babblers although larger than noisy-miners are still small, gentle birds that can be easily preyed upon by hawks and other predators. They stay in their family groups, constantly moving and flitting about so as to confuse any hungry eyes watching them with the wrong intentions. They are generally very shy and quite nervous birds and don't project the immense self-confidence that we've seen in quails for instance. They like hovering in muddy patches, or near gravel, stone, logs and barks looking for insects. We noticed their friendship with the magpies soon after we became friends with Maggie and his sisters Cindy and Tammie. The babblers would gather around where the girls would be pottering and stay close to the magpies. Tammie especially loved marching up and down the babbler clan issuing orders, telling them where to go and what to do and the babblers adored her. They would spend hours every afternoon in her bootcamp. At first we thought she was being too bossy. Then we saw a hawk going for one the babblers. On hearing the babbler cry, the Maggie trio who were not on the ground this time, flew out of their afternoon hideouts and chased the hawk at top speed. The babblers all gathered around the magpies and stayed close to them in the trees as well. Since then we've seen them keep an eye out for the babblers on many occasions and have discovered even more amazing facets to their friendship, which I will tell you about another day. Today is the end of week 1 of the 30Day blog challenge. Permalink Submitted by rosie (not verified) on 9 June, 2010 - 03:48. Permalink Submitted by Gitie on 10 June, 2010 - 08:34. We've been studying the birds for 10 years and keep 'being amazed'.